For the past four years, we at HindSite Software have been conducting a comprehensive, 50+ question survey of snow removal businesses. We parse the results and release them in the Snow Industry Benchmark Report, a nearly 50 page document with 40+ charts and graphs based on the survey results. It’s a data junkie’s dream. Though there are a number of insights in the report that can help snow removal businesses improve and grow, they can get buried in the report. As a result, we’ve isolated 10 of the key findings and will present those in a webinar scheduled from 1 to 2 p.m. Central on Tuesday, July 19. As a sneak preview, here are three of our key findings. Click here to register for the webinar and learn all 10. If you are a snow business, this statement is obvious: If it doesn’t snow, you’re not working. It’s a business that is entirely dependent on the weather for business. Given that weather patterns aren’t all that predictable, that leads to a business that isn’t predictable. That was proven in our Benchmark Report findings. 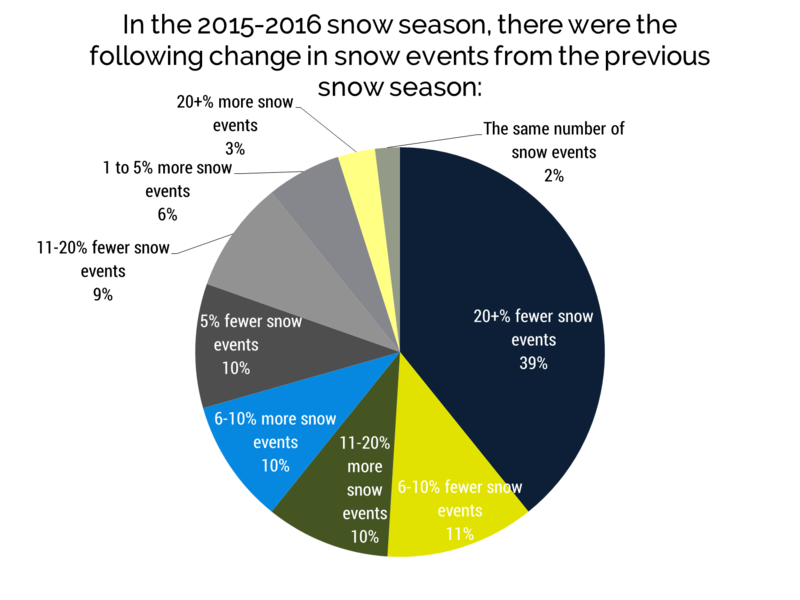 According to the report, nearly 40% of respondents saw 20+% less snow events than the previous year. But because many of them had a good mix of per event and seasonal contracts, just 22% of respondents saw their actual revenue decrease by more than 20%. But too much snowfall can also cause problems. As we heard from many in the Northeast who were blasted with snow in the 2014-2015 snow season, if they had seasonal contracts, they were likely losing money. But if they had a lot of event-based contracts, they likely made a lot of money. So the key to a successful snow business is determining how much risk you want to incur. If you’re willing to take on a lot of risk if it doesn’t snow, you’ll want a higher percentage of event-based contracts. If you’re not, you’ll want to push your customers toward a higher percentage of seasonal contracts. We interviewed Frankie Ippolito, the owner of Ippolito Snow Service in Boston for the Benchmark Report. If you haven’t read that interview story, I’d recommend it. Frankie has a unique perspective on the snow business after taking over for his father following a successful corporate career in a global HR role. One of the things Frankie told us was that it’s just more litigious now. That also showed up in the benchmark report. According to the benchmark report, 35% of contractors had experienced a slip and fall claim in the past year. 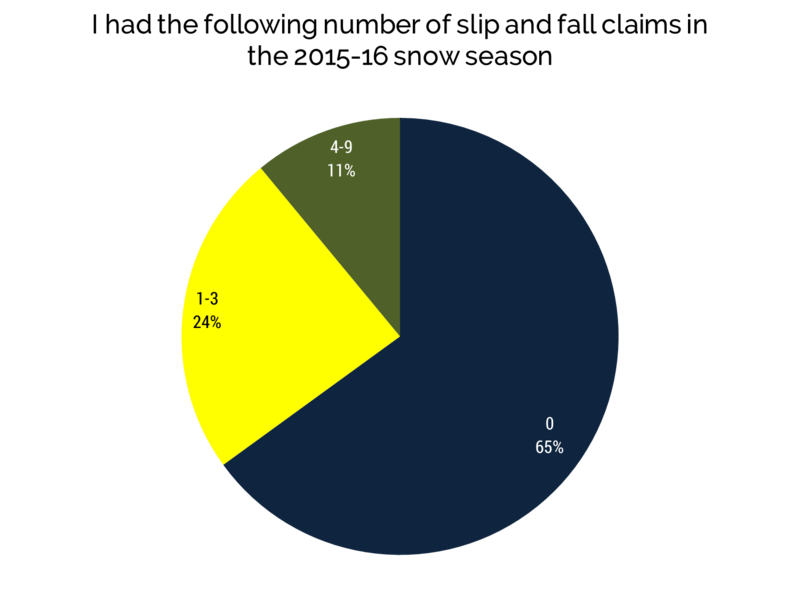 The prior year, it was 19%. Perhaps more troubling, in the 2015-16 snow season, 11% of respondents said they had 4 or more claims in the past year, up from 3% in the previous year. So the takeaway is not only are more snow contractors facing slip and fall claims, but that they’re also facing more claims. So what Frankie told me is correct. So what can you do? Log every activity. Maintaining a complete trail of all your work is the easiest way to keep your exposure low. Obviously, I’m going to advocate for our software, which enables your teams to log in and out of every job, track the amount of deicer used, take pictures of the job site, write down any notes and electronically store a complete work history for retrieval later. But even something as simple as installing GPS tracking devices and software can help you see when and where your team is, which can limit your exposure. The key to avoiding frivolous claims is to have the data that backs up that you did what you were supposed to do. I’m a marketer by trade, so I’ve been using digital marketing tactics for nearly a decade. Heck, our upcoming webinar is an example of that. We’re trying to build awareness about our product by delivering what I hope is a helpful webinar for snow removal businesses. 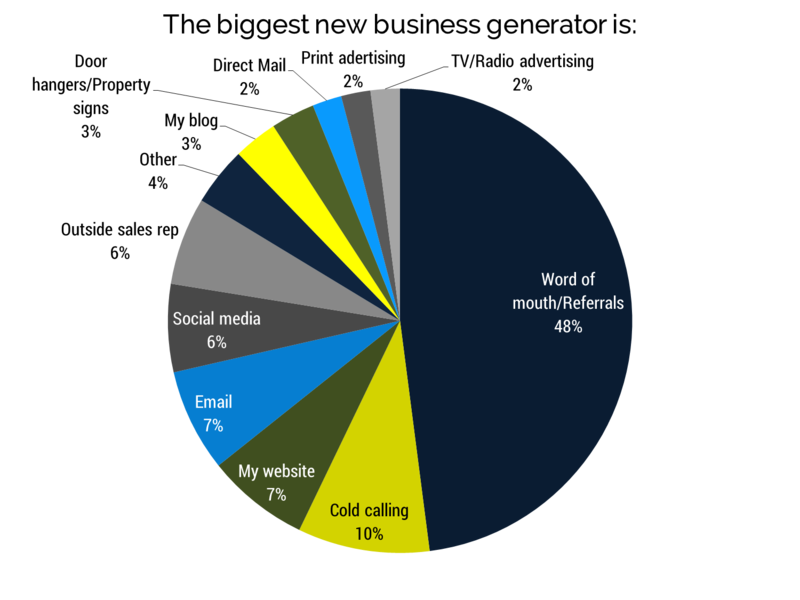 So when I started at HindSite four years ago, I was surprised at how few green industry and snow removal businesses were using digital marketing to find customers. That’s changing slowly, though, according to the 2016 Snow Industry Benchmark Report. This year, 23% of respondents cited digital media - their website, email, social media or their blog - as the biggest new business generator. That’s up 10% from a year ago, when 13% said one of those tactics generate the most new business. If you own a summer business, all your customers may not even realize that you offer snow removal services. Sending an email offer to customers who don’t utilize your snow services is a quick, effective way to generate new revenue. You can also leverage email in day-to-day customer communications. For example, you many of our customers leverage our service business marketing email add-on, HindSite Connect, to send an automated email after they’ve completed removing the snow from the property. It gives their customers a heads up that they were there and when they completed their property. And if you don’t have a website - just under 50% said they do - get one! It’s really not optional for a business that’s looking to grow. If you want more customers, they need a place to learn more about you. Your website is that place. 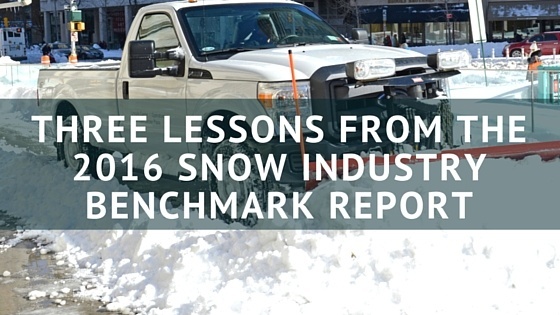 Want to learn the other 7 lessons from the Snow Industry Benchmark Report? Then signup for our webinar on Tuesday, July 19! Just click below to register today!